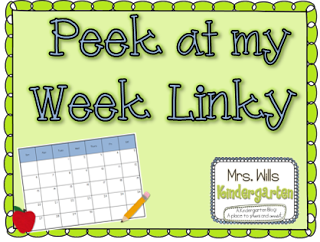 I'm back for a Peek At My Week! Shocked I know! We actually ended up having 2 snow days last week, so a couple of the centers we moved to this week. Because of our 3 day week and little time to plan, we needed something quick and fast for this week...thank goodness for Annie Moffett's units!!! This week we are doing Short i word families from my Winter Word Family Units. I'm looking forward to a 5 day week and getting back into some sort of routine with these kiddos!